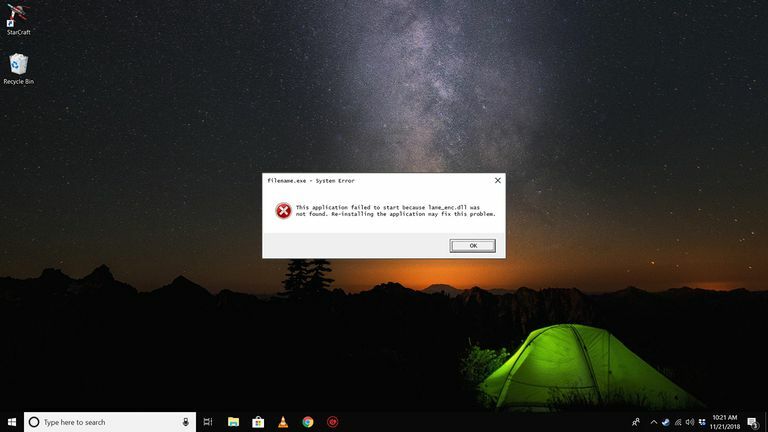 Any error message involving a missing lame_enc.dll DLL file is referring to some issue that the program you're using is having with the LAME MP3 encoder. The first two errors below, generated by the Audacity software program, are by the far the most common simply because Audacity is the most common application that utilizes the LAME MP3 encoder. If you're not using Audacity, your error message will be different and might appear more like the final three examples below. Audacity does not export MP3 files directly, but instead uses the freely available LAME library to handle MP3 file encoding. You must obtain lame_enc.dll separately, by downloading the LAME MP3 encoder, and then locate this file for Audacity. You only need to do this once. Would you like to locate lame_enc.dll now? Audacity needs the file lame_enc.dll to create MP3s. This application failed to start because lame_enc.dll was not found. Lame_enc.dll errors sometimes occur when the audio program you're using is first opened. Other times, the lame_enc.dll error will show up when you attempt to save the audio project you're working on as an MP3 file, such as when you use Audacity to convert WAV to MP3. The lame_enc.dll error message applies to any audio program that utilizes the LAME MP3 encoder. Depending on what program you're using and what operating system you're running, you could see the lame_enc.dll error in Windows 10, Windows 8, Windows 7, Windows Vista, Windows XP, and older versions of Windows as well. Some common software programs that use the LAME MP3 encoder and that might generate lame_enc.dll errors include Audacity, MuseScore, FFmpeg, VideoLAN, jRipper, CDex, REAPER, LameDropXPd, DVDx, OmniEncoder, LAMEX, RazorLame, Audigrabber, RipTrax, WinAmp, UltraISO, VirtualDJ, TextAlound MP3, and many more. Don't download the lame_enc.dll DLL file individually from any "DLL download site". There are many reasons that downloading DLLs from these sites is never a good idea. There are a large number of sites offering the lame_enc.dll for download but there are few legitimate sites that we would recommend. If you've already downloaded the lame_enc.dll file from one of those DLL download sites, remove it from wherever you placed it and continue with the following steps. Close and reopen the audio program that generated the lame_enc.dll error. Audacity, or whatever audio program you're using, might be having a temporary problem that a restart might fix. Download the latest LAME MP3 encoder package. The ZIP file at this Audacity-sanctioned site contains the latest version of the lame_enc.dll and related files. The true source location for the LAME MP3 encoder is located at the LAME site on SourceForge.net but the files here are not readily usable by your audio program. Extract the DLL file from the ZIP file downloaded in Step 2. Windows has built-in abilities to unzip files, but if you prefer a dedicated program, consider using 7-Zip or PeaZip. Copy the lame_enc.dll file to whatever location your specific audio program requires. Or, install the executable version from Step 2. Some programs don't require the lame_enc.dll file to reside in particular folders. Audacity, for example, only requires you to tell it where the lame_enc.dll file is — it doesn't care where. If you're having lame_enc.dll troubles with Audacity, use its Edit > Preferences > Libraries menu to find the MP3 Export Library section. Choose Locate and then Browse to select the DLL file. If you've installed the EXE version for Windows, the DLL file should be stored in the C:\Program Files (x86)\Lame For Audacity\ folder. Reinstall the program that's generating the DLL error if the above steps didn't work, if they don't apply to your program, or if they're too confusing. Reinstalling the software should replace the DLL file if it's a necessary component that's simply corrupted.